IT'S A WRESTLING MIRACLE -- Jerry "The King" Lawler�is back ringside for tonight's Monday Night RAW following his major heart attack in September ... and TMZ has obtained a photo of his triumphant return. 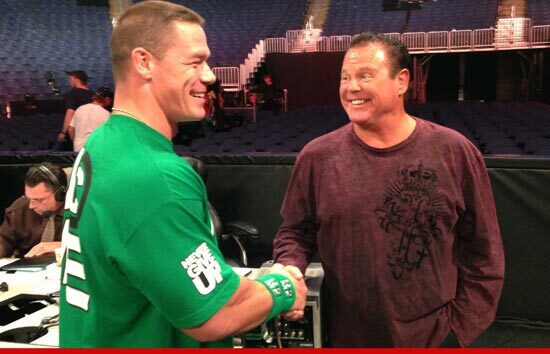 The famed WWE announcer was photographed smiling and looking healthier than ever today -- shaking hands with WWE star John Cena -- while preparing for tonight's show in Columbus, OH ... Lawler's first show since the medical emergency. As we previously reported, Lawler collapsed at a WWE event in Montreal, Canada September 10th after suffering the heart attack. He was commentating ringside when he collapsed. Lawler spent a week in the hospital after the emergency -- and another two months recuperating at home -- before he finally decided to get back to work.